No more will we hear of Harry Kane's August duck regarding the scoring of Premier League goals. Harry put the cap on this 3-1 victory in the 77th minute with a fine finish. He should surely have had a first half penalty and Mauricio Pochettino was uncharacteristically sharp with referee Anthony Taylor as the teams walked off at half-time because the official had denied Kane a spot kick. Spurs were a goal to the good at the interval, thanks to a fine finish by Lucas Moura. At times Fulham had a back line of 6 players including rising star Ryan Sessegnon, who was one of few survivors from last season's Fulham team. The Cottagers had threatened a couple of times on the break though and manager Slavisa Jokanovic sent his team out with attacking intentions at the start of the second half rewarded with Aleksandar Mitrovic's 52nd minute equaliser. Pochettino had started with three at the back, including Toby Alderweireld, whose selection was hopefully a clear statement that he will not be leaving. At times though, Fulham exploited the gaps left inside the wing-backs, so Pochettino took off Sanchez for Dembele, giving Spurs more solidity in the middle, and Spurs once again took control of a game that they had dominated for most of the first half. 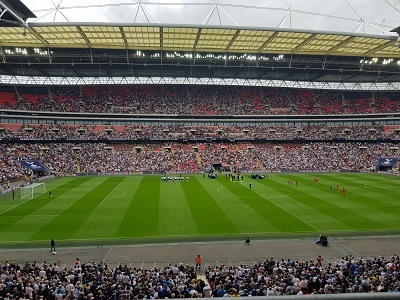 It is still holiday time, of course, and there are those who choose to make a protest of not making the effort to travel across London to Wembley, but this crowd of 58,297 would not fill the new stadium, whenever it is going to be declared safe and ready for occupation. From what I hear, don't count on an October 28th opening either. This new Fulham team is obviously going to take a while to bed in. I was a little surprised to find Sessegnon operating on the right, but Kamara occupied his usual left wing spot. The game was preceded by a hearty one minute's applause for the legendary original "King of White Hart Lane" - Alan Gilzean, who passed away recently. Conditions were moderately warm and dry, with no sunshine. Spurs kicked off and there was an early shot by Ben Davies which passed wide to the left of goalkeeper Fabri. After 3 minutes and from a defensive position, Dele slipped the ball to Eriksen who sent a long ball towards Kane, but Harry could not quite make the necessary contact. Lucas Moura was playing beside Kane, with Dele and Eriksen behind. Harry is more than an out and it striker of course, despite his great scoring record, and he is currently being used quite often in a wide left position, operating as a number 10! Eriksen was very prominent in the early stages, and sent a good long ball across the field to Davies. He passed inside to Dele - also looking sharp again - who switched the play to the advancing Trippier. He crossed deep. Davies returned the ball inside and Lucas Moura's effort was wide. Lucas challenged the Fulham keeper (whose handling and confidence never looked great) and the ball ran to Kane, but Mr Taylor had penalised the Brazilian Spur. Trippier took a corner from the right and Eriksen had a looped header held by Fabri. Kane's denied penalty followed an Eriksen pass from the right, which Harry took into the box before seemingly being felled, but Mr. Taylor wanted none of it. In fairness, the referee liked to allow play to flow, which worked in our favour for our third goal. Also, there were no bookings today. Spurs had some pressure midway through the half, with Trippier to the fore. One move, involving Dele ended with an Eriksen shot passing Fabri's left post. Skilful play by Dele down the left gave a ball to Davies, who passed inside to Kane. Harry switched the play to Trippier, but Eriksen's shot was wide. On a rare break for Fulham, Kamara passed inside to Cairney, whose shot was well saved by Lloris diving low to his right, but not cleanly, and the ball ran clear. After a foul on Eric Dier the free kick was taken by Eriksen, who fired low into Fabri's hands. Toby Alderweireld tried to get in on the attacking act, receiving form Trippier, but firing wide across the goal. Lloris had to be sharp to save from Sessegnon, who had timed hir run very well. Spurs had the ball popping about all over the Fulham area, and Eriksen's final effort was over the target. At long last, Spurs had a well deserved lead. Trippier had been involved again, but it was Eriksen who got the assist before Lucas Moura hit his left footed shot across the goal inside Fabri's right post. Mido had been Paul Coyte's half-time guest, and then Fulham started the second half and came out fighting. Mitrovic hit the outside of Lloris's right post, having received from Cairney. Spurs responded with a good ball down the left channel by Jan Vertonghen to Harry Kane, who passed inside to Eriksen before Dele Alli had a good shot well saved in the centre of goal. Fulham scored their equaliser and you could not say it wasn't coming. The ball had come in for the left and Mitrovic already had one effort saved before Sessegnon teed him up for a close range header. It was somewhat involuntary as the striker was just getting up, but he celebrated with relish. Suddenly the Fulham fans were singing the praises of their team. Fulham were getting too much space, particularly on their left - Trippier's right. After Pochettino's tactical switch and a Spurs corner on the right, Dembele passed to Davies, who fed Vertonghen. Jan had a good shot blocked. Dele Alli had a shot blocked in a follow-up play. Mitrovic had another good chance, but scuffed his shot wide. Spurs had some good pressure, with no clear shot arising. A good ball by Eric Dier reached Harry Kane, advancing in the right side of the box. Harry's shot rebounded off the bar. Dele Alli had been fouled but before the free kick, Eric Lamela replaced Dier. Fulham also made a change of Johansen for Cairney. Kieran Tripper truly lived up to his World Cup billing by cracking home a super free kick which had Fabri well beaten to his right. In no time at all it was 3-1 and the game was secure. Spurs had been given the benefit of a midfield challenge and Erik Lamela advanced passing well again to Kane who was on the left side of the area, Harry picked his spot and hit a measured right foot shot beyond the goalkeeper's left hand into the far corner. That duck was broken, and the game was won. There were further chances for Lamela and Kane, Dele and Ben Davies. Fulham had nothing left, and have lost both their opening games. Spurs on the other hand have won twice and led the table albeit briefly before the Chelsea-Arsenal game. Another London side lost at home to Bournemouth today. That was West Ham who are bottom of the table. It has been a very good day!